On the 24th May, Oxford Pakistan Society was condemned by the Labour MP for Mitcham and Morden, in Parliament, for their decision to not screen a documentary about Professor Abdus Salam, the first Pakistani Nobel prize winner. However, various other university-wide societies have come out in support of the Oxford Pakistan Society’s Committee and President. The documentary, itself, was screened at Oxford, but the event organisers did set up a petition, on change.org, calling for the resignation of Haroon Zaman, as President of PakSoc. Salam belonged to the branch of Islam, known as the Ahmadiyya Muslim community. Ahmadi Muslims have faced persistent discrimination in Pakistan, as they are considered by some to be heretics and were declared as ‘non-Muslim’ under Pakistani law. Ahamdis living in Britain have also voiced their concern about potential discrimination growing against their community. McDonagh, said in Parliament: “We return a final time to the case of Nobel prize winner Professor Abdus Salam. “Earlier this month, Oxford University hosted the first UK screening of a film about him, but the university’s Pakistan society has been accused of discrimination due to its reluctance to get involved based on Professor Salam’s Ahmadi faith, forcing an apology after an extremely successful event. 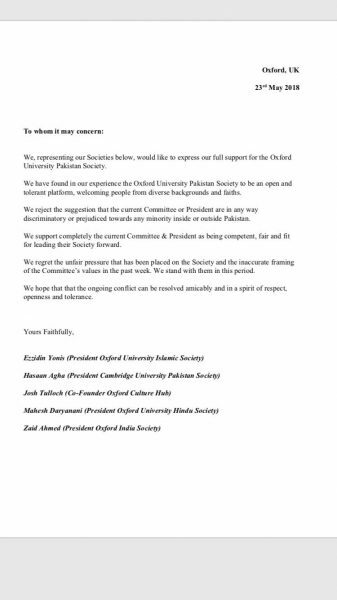 Chaudry’s comments follow a decision by the Presidents of various other societies to submit a letter in support of PakSoc, which was sent to every member of PakSoc through their mailing list. They added: “We regret the unfair pressure that has been placed on the Society and the inaccurate framing of the Committee’s values in the past week”. The petition calling for resignation of the current President of PakSoc has now had over two thousand signatures.